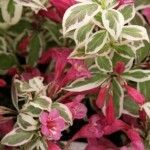 A compact shrub with green leaves and creamy-white margins. The new growth has pink highlights that intensify as the season progresses. The spring flowers are purplish-pink. The overall look is soft and subtle, hence reminiscent of the works of Monet. It grows best in full sun and an average, well-drained soil. Prune after flowering as needed. 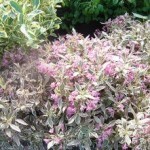 It is useful for mass planting, in the shrub border, or containers. PP 16,824.